Global Warmth Blended land and sea-surface temperature percentiles during January 2014. Red is warm and blue is cold. Much cooler than average temperatures in the eastern U.S. were swamped by warmer than average temperatures elsewhere around the globe. 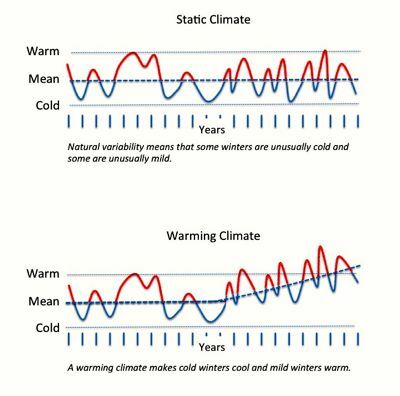 Image courtesy of National Climatic Data Center. State Ranks During January 2014, states east of the Mississippi were generally cold, while western states were generally warm. Image courtesy of National Climatic Data Center/NESDIS/NOAA. Global Warmth Blended anomalies in land and sea surface temperature in degrees Celsius during January 2014. Red is warm and blue is cold. Image courtesy of National Climatic Data Center. Global Warmth While parts of the eastern U.S. were unusually cold in January 2014 (the latest month for which global data have been analyzed), the globe overall was 0.52°F above the 30-year average. Image courtesy of Earth System Science Center at Univ. of Alabma Huntsville. Residents of Tidewater Virginia know that it’s been a cold winter. Data from NOAA’s National Climatic Data Center show that January 2014 ranked as the 12th-coldest January in the Commonwealth since recordkeeping began 120 years ago. 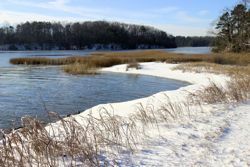 The cold brought chilly waters and ice to large stretches of the Chesapeake Bay shoreline, with impacts to local oyster farmers as well as populations of speckled trout and other finfish. It also made some people question the validity of climate warming. But "weather isn’t climate,” says Professor Roger Mann of the Virginia Institute of Marine Science. Mann, a member of then-Governor Tim Kaine’s 2008 Climate Change Commission, joins with other local scientists in noting that the globally averaged surface temperature during January 2014 was 1.17°F above the 20th-century average. That makes it the warmest January since 2007 and the fourth warmest on record. It is also the 347th-straight month of globally averaged surface air temperatures exceeding the 20th-century mean. Dr. Bruce Wielicki, an atmospheric scientist with NASA’s Langley Research Center in Hampton, says we need look no further than the western U.S. to understand that the East Coast’s recent cold weather represents a short-term, regional episode rather than a long-term global trend. Indeed, while many states east of the Mississippi River saw one of their 10 coldest Januarys last month, many western states were unusually balmy. California experienced its 2nd warmest January in 120 years of record, while Arizona had its 4th warmest January and Nevada its 7th warmest. Alaska experienced its 3rd warmest winter in 96 years of recordkeeping. Unlike the seeming novelty of a chilly winter in the eastern U.S., Alaska’s recent warmth is consistent with both long-term trends and climate-models predictions. VIMS Professor Walker Smith, who has spent the past 30 years studying polar ecosystems, says that high-latitude regions are warming faster than anywhere else on Earth, with a 5° to 7°F rise in average winter temperatures in the Arctic and along the Antarctic peninsula during the last 50 years. The extent of Arctic sea ice has decreased by more than 40 percent since satellite records began in 1979, with the Arctic Ocean now projected to be ice free in summer by 2050 or sooner. A modeling study by Smith and colleagues at Old Dominion University, scheduled for publication in next week’s issue of Geophysical Research Letters, projects that global warming will cause Antarctica’s Ross Sea—one of the few polar areas where summer sea ice cover has actually increased during the last few decades—to lose more than half its summer sea ice by 2050 and more than three quarters by 2100. A warmer ocean concerns Mann, Smith, and other scientists at VIMS, as it contributes to the sea-level rise that threatens Virginia’s coastal communities; stresses seagrass, corals, and other marine life; and will likely transform ocean food webs in rapid and unpredictable ways.